By some estimates virtual reality (VR) will be a US$162 billion industry by 2020. Only 50% of this figure is projected to come from hardware sales; the rest will be revenue from software, content and services. It’s not just the size of the market that advertisers cannot afford to ignore, but the unique potential of VR to influence choices and behaviour. This is due to something called the Sense of Presence. Presence is the feeling that you are actually within the scene, as if you are physically there. Sense of Presence: The Future of Virtual Reality. With presence, a whole host of other psychological factors come into play. Researchers at Stanford University’s Virtual Human Interaction Lab have been studying the effects of VR on behaviour for years and have come up with some amazing results. Perhaps most notable is their finding that how we appear to others and ourselves in VR can change our behaviour in the “real world”. Prematurely ageing someone in VR, for example, was found to make them think about their future. This led them to spend less and save more in real life. Other studies found that participants’ visibly losing weight in VR was associated with exercising more and eating less, and that subjects could be made to feel more confident and social. 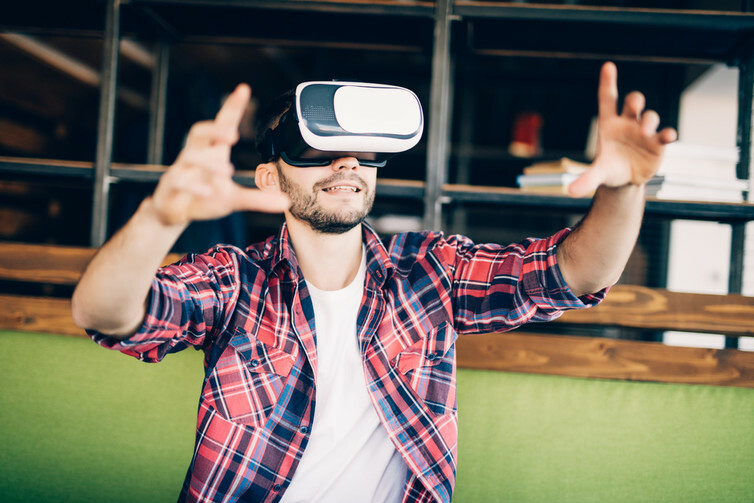 As one of the primary aims of advertising is to influence buying behaviour, this means VR opens up even greater possibilities than traditional forms of advertising media. You could almost liken it to having a salesman in every person’s computer. While VR advertising is still in its infancy, it is growing. The use of VR adverts is somewhat closely linked to the rise of VR apps, but not completely. The rapid adoption of 360-degree videos is one sign of this. These videos are shot with special cameras, allowing viewers to choose where they look during playback. They can already be delivered across a wide variety of platforms, including Facebook and Youtube. This video of a fashion show illustrates perfectly how the technology works. The viewer can spin around using their computer mouse or by moving their phone, yet it still works as a normal video. 360° video VR Fashion Show – Freedom of Fashion – de Bijenkorf. Some major companies are already putting out 360 content. Nike and Coca Cola are just two examples. Sports leagues like the NBA are starting to broadcast in VR, creating slots to advertise in virtual reality. Distributors are also coming to market, ready to bridge the gap between VR advertising and these platforms. Omnivert is one and Virtual Sky another. They bill their 360 advertising in the categories of sponsorship ads (like those that play on YouTube videos) and experience ads, where customers can get an immersive view of the actual experience that is being sold. The advantage of these companies is that they will distribute content that runs on a variety of VR hardware as well as normal PCs, mobiles and tablets. This means anyone can view it. The disadvantage of 360 videos is the fixed viewpoint of the camera. In true VR the viewer is usually free to move around the scene at will. This requires programming and the use of specialist software to create and deliver. But this, too, is only a matter of time. As the technology and industry mature, the computing requirements and cost for VR are starting to drop. VR will be increasingly accessible and the opportunities to advertise will grow as well. This presents an opportunity for advertisers, especially those unhappy with current digital offerings. VR is a new market with lots of growth ahead of it, but it also has huge potential to change behaviour and choices. We are only at the beginning of research and practice into VR and psychology.